Koreans love to drink. I remember reading about their high level of alcohol consumption while I was in Poland and I thought, ‘No way could anyone drink MORE than Polish people or Eastern Europeans in general’. BUT, then I got there and discovered that where there’s a will, there’s a way and the Korean people certainly found a way. Case in point, I’ve seen Koreans throw back Soju (Korean rice wine) at BBQ’s, on mountain climbing trips, while river rafting and during pretty much any other activity that expresses their love of the outdoors (this includes passing out on the sidewalks – hey, it’s still outside). Any expat who has lived in South Korea for an extended period of time has a story about drinking too much Soju and either hugging a refrigerator crisper drawer (for puking in) whilst passing out on the floor or hallucinating that the CIA was coming to get them. The next morning you consider giving up the spirit entirely but then you wait a couple of months and try it again because, like the Korean people, Soju is resilient and that should be respected. This cocktail is modeled after the hotel bar green tea martinis which my husband and I drank in celebration of our engagement. However, instead of vodka or gin, I’m using Soju as a nod to my time spent in South Korea and because there just aren’t many cocktails centered around the Korean alcohol. If you can’t find it, no worries-just substitute vodka and make a martini. This cocktail goes well with Korean fried chicken, any kind of barbeque and KTV (karaoke). Just be careful of where you end up later after one too many cocktails. 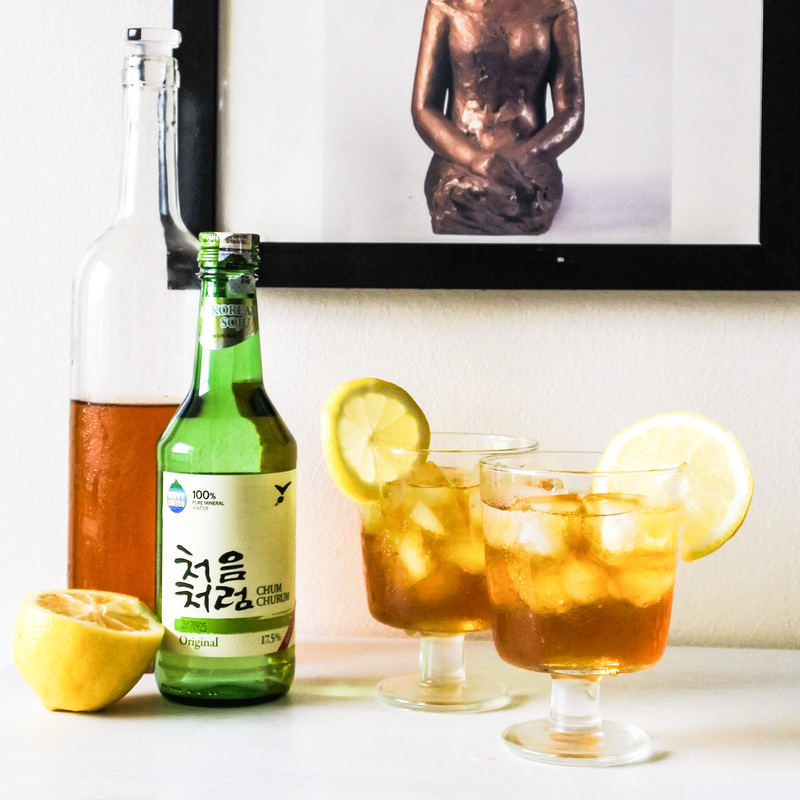 A delicious and refreshing cocktail made from Korean Soju and green tea syrup. It just might become your new favorite boozy iced tea! Combine the ingredients in a medium sized saucepan and let simmer for 10 min. Run through a sieve and let cool. Cover and refrigerate after making. The green tea syrup can be used for cocktails (alcoholic and nonalcoholic), drizzled over fruit or shaved ice and other desserts.